Pax Cake distribution, St Catherine's church, Hoarwithy, Hereford and Worcester. England 1974 Palm Sunday. The Revd. 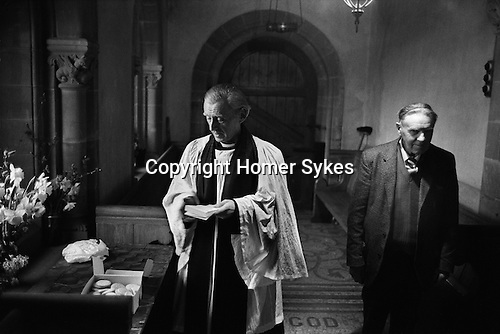 Idris Michael Evans, the Vicar of Hentland with Hoarwithy and Sidesman Mr Stan Jones. The image on the Pax cake is the 'Agnus Dei', the Lamb of God. In the 1970s, Pax Cakes were distributed at both St. Catherine’s Church (Chapel of ease) Hoarwithy and St Dubricius (Parish Church) Hentland.